Sound event localization and detection (SELD) is the combined task of identifying the temporal onset and offset of a sound event, tracking the spatial location when active, and further associating a textual label describing the sound event. The paper describing the SELDnet can be found on IEEExplore and on Arxiv. We are releasing a simple vanila code without much frills and the related datasets here. 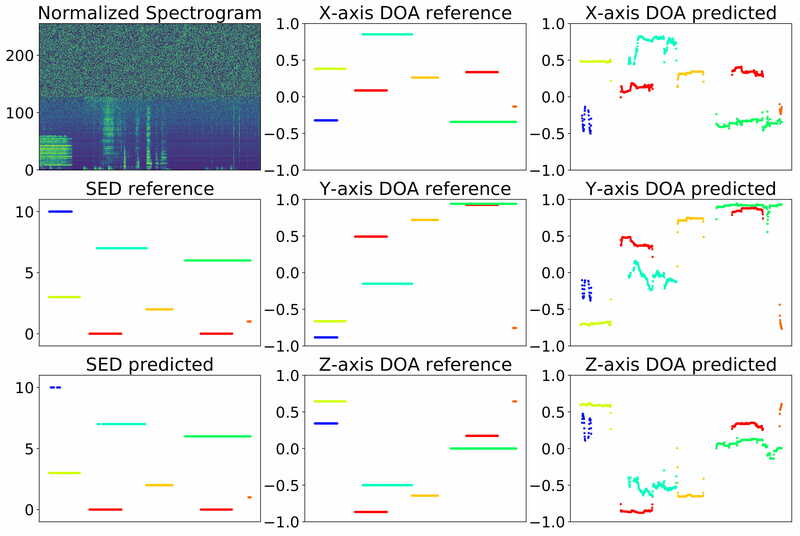 The work presented in this paper is an extension of the previous multichannel sound event detection, and direction of arrival estimation papers listed below. The proposed SELDnet architecture is as shown below. The input is the multichannel audio, from which the phase and magnitude components are extracted and used as separate features. 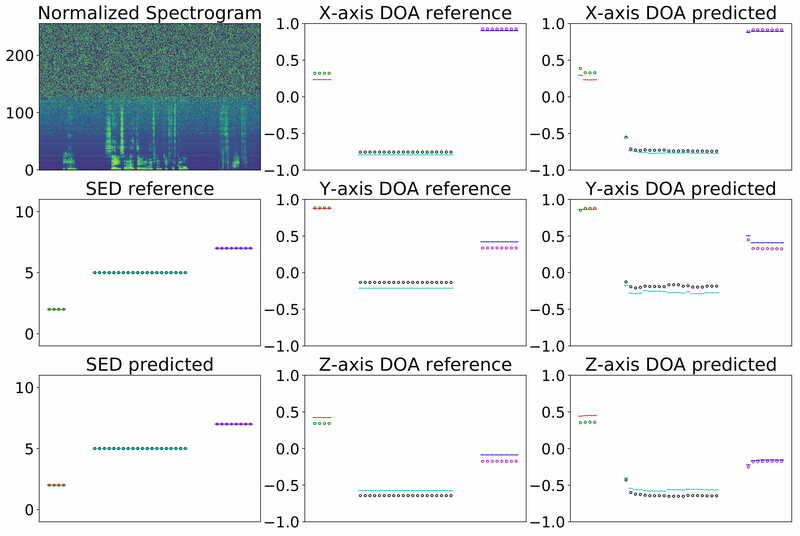 The proposed method takes a sequence of consecutive spectrogram frames as input and predicts all the sound event classes active for each of the input frame along with their respective spatial location, producing the temporal activity and DOA trajectory for each sound event class. In particular, a convolutional recurrent neural network (CRNN) is used to map the frame sequence to the two outputs in parallel. 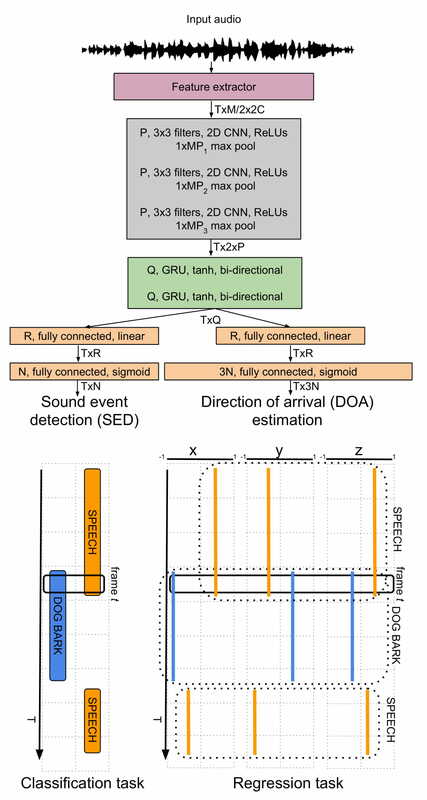 At the first output, SED is performed as a multi-label multi-class classification task, allowing the network to simultaneously estimate the presence of multiple sound events for each frame. At the second output, DOA estimates in the continuous 3D space are obtained as a multi-output regression task, where each sound event class is associated with three regressors that estimate the 3D Cartesian coordinates x, y and z of the DOA on a unit sphere around the microphone. The SED output of the network is in the continuous range of [0 1] for each sound event in the dataset, and this value is thresholded to obtain a binary decision for the respective sound event activity as shown in figure below. Finally, the respective DOA estimates for these active sound event classes provide their spatial locations. 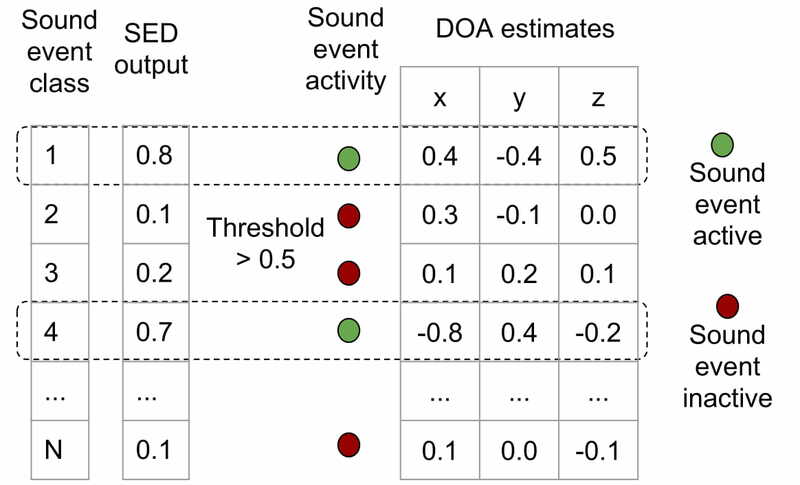 The figure below visualizes the SELDnet input and outputs for simulated datasets with maximum one (O1) and two (O2) temporally overlapping sound events. The horizontal-axis of all sub-plots for a given dataset represents the same time frames, the vertical-axis for spectrogram sub-plot represents the frequency bins, vertical-axis for SED reference and prediction sub-plots represents the unique sound event class identifier, and for the DOA reference and prediction sub-plots, it represents the distance from the origin along the respective axes. The 'o' markers in left figure and '•' markers in right figure visualize both the groundtruth labels and predictions of DOA and SED for O1 and O2 datasets. The − markers in the left figure visualizes the results for test data with unseen DOA labels (shifted by 5 degree along azimuth and elevation). The figures represents each sound event class and its associated DOA outputs with a unique color. We are releasing all the simulated datasets and the small real-life dataset without ambiance used in the paper on zenodo.org. These datasets are in the range of 30-45 GB and fit within the dataset budget of zenodo.org. The larger datasets can be shared upon request. All of these datasets consist of stationary point sources each associated with a spatial coordinate. All the datasets contain three sub-datasets with maximum one (ov1), two (ov2) and three (ov3) temporally overlapping sound events. Each of these sub-datasets have three cross-validation splits (split1, split2 and split3). In total each dataset has nine splits saved as separate zip files. In order to test the SELDnet code you don't have to download the entire dataset. You can simply download one of the zip files and train the SELDnet for the respective overlap (ov) and split (split). This repository consists of multiple Python scripts forming one big architecture used to train the SELDnet. The batch_feature_extraction.py is a standalone wrapper script, that extracts the features, labels, and normalizes the training and test split features for a given dataset. Make sure you update the location of the downloaded datasets before. The parameter.py script consists of all the training, model, and feature parameters. If a user has to change some parameters, they have to create a sub-task with unique id here. Check code for examples. The cls_feature_class.py script has routines for labels creation, features extraction and normalization. The cls_data_generator.py script provides feature + label data in generator mode for training. The keras_model.py script implements the SELDnet architecture. The seld.py is a wrapper script that trains the SELDnet. The training stops when the SELD error (check paper) stops improving. The utils.py script has some utility functions. If you are only interested in the SELDnet model then just check the keras_model.py script. The SELDnet code trains the network for a given dataset (ansim, resim, cansim, cresim or real), overlap (ov1, ov2 or ov3) and split (split1, split2 or split3) at a time. In order to quickly train SELDnet follow the steps below. For the chosen dataset (ansim or resim or ..), overlap (1, 2 or 3) and split (1, 2 or 3), download the respective zip file. This contains both the audio files and the respective metadata. Unzip the files under the same 'base_folder/', ie, if you are downloading overlap 1 and split 1 of the ansim dataset, then the 'base_folder/' should have two folders - 'wav_ov1_split1_30db/' and 'desc_ov1_split1/' after unzipping. Now update the respective dataset path in cls_feature_class.py script. For the above example, you will change line 22 to self._base_folder = 'base_folder/' (below dataset == 'ansim'). The normalized features, and labels are written in the same folder, so make sure you have sufficient space for it. Extract features from the downloaded dataset by running the batch_feature_extraction.py script. First, update the dataset_name, overlap and split values based on the downloaded dataset. See the python file for more comments. You can now run the script as shown below. This will create a new folder inside the 'base_folder/' and dump the normalized features here. Since feature extraction is a one-time thing, this script is standalone and does not use the parameter.py file. As you can see in the script, you can extract features for all possible overlaps and splits in one shot with this script. Where <job-id> is a unique identifier which is used for output filenames (models, training plots). You can use any number or string for this. By default, the code runs in quick_test = True mode. This trains the network for 2 epochs on only 2 mini-batches. Once you get to run the code sucessfully, set quick_test = False in parameter.py script and train on the entire data. The research leading to these results has received funding from the European Research Council under the European Unions H2020 Framework Programme through ERC Grant Agreement 637422 EVERYSOUND.